"The Origin of The Teen Titans"
Sitting in the snow outside the temple, Tim Drake is approached by one of the monks offering soup. Bruce Wayne has walled himself in a mountain cave fifteen feet away from Tim. The boy wonder sees this as an excellent opportunity to practice his meditation techniques, but confesses that he finds it impossible to think about nothing. The monk concurs and offers instead a riddle to focus on: "There's a goose inside a bottle. How do you get the goose out without injuring it or breaking the bottle?" In�Tim's�room, Diana inquires as to what's going on with Bruce. Following his trip to the desert and the exorcism of his demons, Bruce�felt truly vulnerable without them.�In New Delhi he�encountered one of the monks from Nanda Parbat who told him of a spiritual purification ritual they perform, so he and Tim climbed the 9,999-step stairs to the temple�seeking their help. While�they talk, Bruce screams in the�dark. In Gotham City,�Whisper, Abbot, and company perform a ritual from the Bible of Crime to extract�the information they seek regarding "The�Twice-Named Daughter of Cain," whom they believe to be Batwoman. After killing the man, Whisper is scolded by Bruno Manhiem, who is losing patience�with�every failed attempt thus far to locate the woman.�She is the key to unleashing�Cain's "Holy flames" onto Gotham. He then gets into a heated argument with Abbot, who morphs into his animal form as it comes to blows. Whisper�breaks�up the fight with her�discovering the true meaning behind the riddle: the twice-named daughter of cain has to have Cain as a last name. Black Adam's cries echo through the entire complex, reaching the lab and ears of Doc Magnus, who is in�an aggravated, panicky state. He knows no good will come of their efforts to bend the leader of Khandaq to their will, nor the robotic monstrosity he has recreated. Out of curiosity, he turns the Plutonium Man on, and immediately it belches out "Crush. Raze. Trample". Then�miniature versions of Metal Men pop out of his inner breast pockets urging him to shut it down. He concurs. The yellow-headed aliens who upgraded Animal Man's powers observe him as he demonstrates his mastery of the sun-eater's abilities with satisfaction. They note he'll soon be able to make�use of Space B to return home. As he approaches at frightening speed, one of them presents Buddy with an image of his wife, and he�is startled to see Ellen enjoying the company of another man. The�aliens leave him to contemplate this. Natasha Irons,�testing out her�new�Steel armor, soars above�the skyline with Beast Boy in the form of a bird. Nat tells him she's not ready to join the Teen Titans yet, explaining that she and her uncle John�are working at putting together a team of their own to attend to other Everyman victims. Descending in the parking lot of Steelworks, John Henry comes out and asks how the armor handled. Nat already has a list of things that could use work, such as intake valves, thruster calibration, and pressure bleed from the boots. She tells him she'll look after these problems because it's HER armor. While she heads inside to get changed,�Gar and John talk about both the rejection and the prospect of putting a team together. John downplays the idea by noting it's just a group of people working towards a common cause. The construction workers on hand complete their installation of the new sign, which Nat does the honors of unveiling. It reads "Steelworks: Solving Problems the Old-Fashioned�Way -- With Hard Work, Ingenuity, and Elbow Grease." While Gar, Nat, and an unnamed individual�head inside, Kala tells John she quit S.T.A.R.�Labs and�asks if they're hiring. When John asks her what skills she can bring to the table, Kala interrupts and kisses him passionately. What he calls harrassment she calls romance. Renee Montoya, dressed in Charlie's�trench coat and fedora,�heads up to Katherine (Kate)�Kane's penthouse apartment hoping to talk to her. However, she finds the doors opened and�discovers the place in shambles, complete with a busted window. Renee collapses in defeat, knowing�she was too late to�warn Kate. Nightwing is then at the window and says though "they" took her, he and Renee are going to get her back. Diana seeks an audience with Rama Kushna, Diana explains she has lost her way in life; though originally a peace ambassador when she left Themyscira, the years of death, battle, and confusion have left their mark on the princess. Rama Kushna answers "When did you, in all your perfection, ever share the pains mortals feel each day of their lives? Until now. Welcome to the world, Wonder Woman. Here is wisdom." Following his rebirth as Cyborg, Victor Stone found good fortune by being inducted into a group of superhero sidekicks known as the Teen Titans, who helped him channel his anger to superheroics and make peace with his new life. Then all of it changed�the day a Superman robot went rogue and went on a killing spree that took the life of not just a Titan, but also a member of�another young�superhero group, Young Justice. Realizing there was a need for the Teen Titans for young heroes, Victor, along with teammates Starfire and Beast Boy rebuilt Titans Towers in�San Francisco and folded�Young Justice into the new team, this time taking their lead from the senior members. Main Story - 5: I've been waiting patiently for a Bat-oriented story in this series and finally got one. In fact it was so character-driven I didn't mind that they took a break from the Black Adam storyline. Though it didn't have the quintessential cape and cowl, it made up for it by depicting the usually chillin Bruce Wayne in a very low point during a purification ritual. It also showed a mature side of Robin, as well as his eagerness to push himself�to�the limits of learning. That goose riddle was a good one. I�was shocked in an earlier issue when Bruce purged himself of his demons, thus exorcising the Batman from his life. It makes sense that those demons gave him his edge because they've been a part of his life for so long they're like his armor. And it looks like the Batwoman story's heating up again, which is good and Renee's tactics seem to lean more and more towards her being the official new Question. The only weak moment was the Animal Man subplot. Yeah there's the tragedy of Buddy finding out his wife is moving on with another man, thinking he's dead, but it could've been handled differently.�Other than that you guys did one hell of a job! Art - 5: There's not much I can say about the artwork, only the imagery of a bat always in the presence of Bruce Wayne (on his face or on the boulder) seems too stereotypical. Though cool, we already know who he is so why go through it? Other than that great job. Back-Up Story - 4: First off, it's clear that Waid took into account the legal battle over the rights to "Superboy", for there's not one mention of Connor anywhere. It seemed like this origin was split between the Titans' origin and Cyborg's to a point. I'm extremely disappointed that Con-El was left out and that Waid condensed it so much that he even neglected to reveal the names of the deceased. I suppose it's because explaining what happened to Donna Troy after she was killed would've taken too much room. Good writing, though. Back-Up Art - 3: Don't get me wrong; Karl is a great artist, but I don't think he was the right man for this job. And again, the only reference of Superboy is a tall kid with a black shirt walking with his back to us. Cover Art - 4: This cover has something that the others didn't: foreshadowing. This time the story you see on the cover is the story in these pages. Too many covers have misled the reader, but this time it targeted that the story surrounding the Bible of Crime. 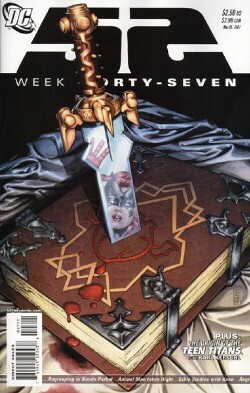 Having Batwoman's face in the reflection of the blade was a great use of suspense. Keep up the good work.